Here we are again, watching as the names of the victims are read on TV. Only this year, we're watching it streaming on the Interwebs. For those new readers, here's my original 9/11 post, written by my Pop who worked a few blocks away from the World Trade Center. He was a witness to history and to the carnage that unfolded. I remember going to the Yankees/Red Sox game the night of 9/10/01. We had an amazing thunderstorm with the rain cascading down the facade of the old stadium and the game was cancelled around 9 pm. On the subway home, we talked about getting to work on time instead of going in late, as we had planned. Yanks/Sox games always last way too long. I got to the office about 8:47 am that morning and had just turned on my computer to start work. It was a beautiful Tuesday and it was the weekly close. I had signed on and began to open applications when I heard someone say the WTC had been hit by a plane. We thought the plane was a small private plane. A group of my coworkers and I went to the window to see what was going on. We saw the North Tower ablaze; papers fluttering in the sky like large snowflakes. We also saw objects too heavy to be paper plunging to the earth and didn’t know we were watching people jumping from the building. All you could hear were the sound of sirens from the Fire Department, Police Department and EMS all rushing up Broadway to the disaster. We were all wondering how they would fight this fire. Another coworker yelled a plane was coming. As she yelled, the entire bank of windows on the 27th floor of 1 State Street turned dark as the plane whizzed so close by you could read all the markings on the bottom. The building shook from the power of the jet engines. The plane sped toward the tower, although it looked to be happening in slow motion. The explosion that followed was more vivid than anything Hollywood could create. My boss started yelling it was time to get out of the building. He was yelling to get our belonging and evacuate. People were running to get their things while I—being the grandson of a fireman—stood transfixed by what was unfolding at that window. The sight of a box of continuous feed computer paper floating out from one of the broken windows and then slowly unraveling as it made it’s way toward the ground just amazed me. Then I felt the heat from the explosion and I too knew it was time to leave. 27 flights of stairs later, we were standing in Battery Park watching, again not clear as to what we had actually seen. No phones—either land lines or cell—were working so we couldn’t call our loved ones to tell them we were ok. This photo appeared in Vanity Fair. It was taken by Will Nuñez from the same building that Pop works in. R and V and some others chose to stay and try to find a phone that worked. My department chose to walk. We wound our way up the East Side of Manhattan looking for safety, being careful to walk along the water and away from the buildings. Somewhere in Chinatown we heard the roar of what sounded at first like another plane and then like a subway train. The South Tower had fallen and what we heard were the floors pancaking. Fortunately, we were far enough from the plume of smoke and dust that we didn’t inhale any of it. We continued to walk until we were in Little Italy when we heard the sound again. This time we turned around in time to watch The North Tower falling. None of us would ever be the same again. None of us will ever forget that moment. It will be hard to forget that 14th Street (about 4 miles from where I work) and somewhere is where civilization started to appear again only there were soldiers directing traffic. We ended up on 62nd Street and 1st Avenue, ironically near where I had once worked. I thought about that as we walked. We caught our breath, got to see some tv coverage, got something to eat and it was time to move again. The attacks took place before 9:00 am EST and I got home to my two cats sometime after 8:00 pm EST. In between, a friend and I saw 7 WTC also collapse from the attack. We were at 23rd Street and the Hudson River waiting for a rescue boat to take us to Jersey. I now cherish the extra time I’ve been given and the people I knew then and know now. I’m sorry we all had to go through this, but at the same time it has made us better and stronger. Everyone after 9/11 wrote and spoke how they never would forget this day but since then it sometimes seems to me people look at what happened as an inconvenience. People from the rest of this country seem to want to forget it was America, not New York City that was attacked. We all remember our brave soldiers who gave their lives every year on Memorial Day and all our soldiers who are doing and have done their duty on Veterans Day. On this day we need to remember all the innocent who did nothing more than come to work that day or get on a plane to begin a vacation/business trip. I wish for all of you peace, health and happiness for whatever days we all have left. Please don’t forget as I never will. TW worked around the corner from St. Francis of Assisi Church. She's not an overly religious person but she used to stop in during her lunchtime when the urge struck her or she needed guidance. Every October, she'd pray that the Yankees would have the strength to play a little bit better than the other playoff teams they were facing. Father Mychal Judge never failed her from 1998 to 2000. On September 11, 2001, they say he was the first victim to perish after the World Trade Center was hit. As you know, St. Francis is the patron saint of animals, which made it the perfect choice of worship for TW. We wanted to pay tribute to Father Judge. I read this every year, and am still awestruck by the power of Pops' words. All I could do from my safe little lab in St. Louis was stream news footage all day. I have seen the Pentagon memorial, and it is inspriring. One day I hope we can see the NYC memorial together. Pop's story always gives me kitty goose bumps. We will always remember. I'll never get tired of reading this post CK. THank you for running it again. Oh Keisha we have a tear in our eye reading pops words. We wish him well. The year was our worst. Peeps mum died, 9/11 happened and then the British country side burned for months as they killed so many cattle trying to prevent the spread of foot and mouth disease. Just a horrible horrible year. We say a prayer for all the people who suffered on that tragic day. I hadn't seen this post before and it is wonderful. The only other person that I read about was that gal that wrote the book about Homer the Blind cat. So many people have so many memories. Love this and the tribute to Father Mychal. Very well written, all of it. I've not read this story before, but I will never, ever forget that horrible day. 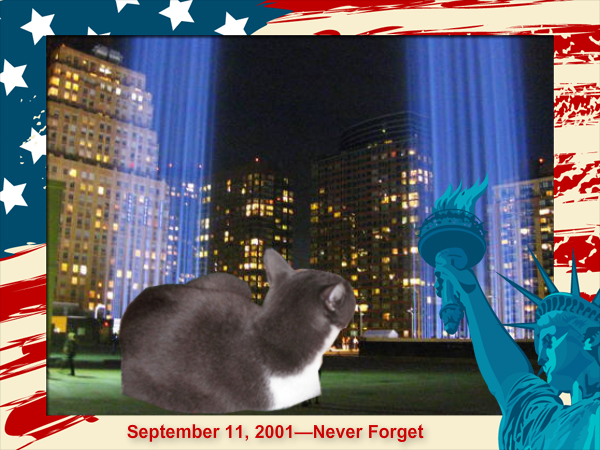 Our purrs and prayers are with the families who lost loved ones, friends, and co-workers on 9-11-2001. CK, your Pop's account of that day moves us so deeply. We are grateful that he's able to share his memory of that horrible day in a way that showers us with love and peace. Bless all of the souls and families. Mom was at work, and when she heard the news, she and some other people went up on the roof of their building and looked towards the Manhattan skyline in the distance and could see the twin towers burning. She was terrified and just wanted to be home. The terror lasted for many weeks and she developed a lot of anxiety the next year. She cannot imagine how much more the impact would have been to be right there. Our prayers and purrs for the people who perished, for the heros, for the families, for the Nation. Your story helps us never forget, to realize how life can change in a moment and how to remember to hug you the next time I see you, too! New York has always been a second home to my L.A.-born and bred human, and she was devastated by 9-11 on so many different levels. Many of her friends went through similar experiences as your male human's. Thank you for posting your pop's story again, CK. So moving. I couldn't imagine being there...that close...that day. We will never forget those that were forever affected by the events of that day...especially those that perished. This was truly heart-wrenching. He was such a good priest, and a good citizen, and a good man. The finest tribute you can give someone. We miss all those who lost their lives that day, and pray for those left behind. We will NOT forget. CK, thank you again for putting this here for us. I remember it and I will ever ever ever tire of reading it. It is an extremely special and very personal telling of a horrible infamous cowardly act that changed the face and mind of America. That memorial video, along with both stories gave us leaky eyes. It was a terrible day and we will never, ever forget. Wow! We have chill bumps and tears after reading his account. Purrime Ministerettes pray for everyone who has lost a loved one on 9/11. The other day we saw documentary on National Geographic Channel about some woman who had fabricated a whole story about her surviving the attacks on one of the towers, but losing her husband. In reality, this woman turned out to never have been to the US until at least a year later. She is Spanish, but had worked her way up to the Chairmanship of a survivor's group. We dunno if you heard that story. She went under the name Tania Head. It's a story that made us feel sick. Terrible for the survivors and hoomans who has lost loved ones. Purrime Ministerettes bow heads in respect. Mom read this today on her train ride, Pops does a terrific job writing about that day. It's a day she'll never forget. We love the tribute to Father Mychal also, his is a special soul. Thank you for sharing your Pop's words about his experience that painful day in our country's history. We will never forget. Thanks for sharing your story. I didn't know you were in NY then. I'd just moved to NY from Canada a few few days before and was picking up my wedding dress near the Towers just couple days before. Being new to the city, I got lost and used the towers as my signpost for the first and last time. We think you should continue to post this every year - because like your pop, we strongly feel that people should never ever forget that tragic day. Thanks CK for posting this again!